There are many good reasons to travel. One reason is to refine your views of life by seeing the new and seeing anew. Another is to get re-inspired; to go home with renewed vigor for creation and living well. Refreshment and relaxation are important aspects of vacations, though not always as prominent as they could be. Another good reason to travel to new places is to be reminded of what you know but haven’t thought about enough or lived enough lately. Visiting places of beauty— whether natural or manmade—are on the top of my list of places to visit. Being around the beautiful and bountiful speaks to deep parts of myself, ancient wisdoms, subtle whispering that I do well to listen to. In the Allerton Garden in Kauai is a water feature I recommend visiting. I was just there on a tour of these gardens on the island’s southern coast. It is situated in a magnificent little valley opening into the ocean. There are many lovely outdoor garden rooms, sculptures, trees, plants, waterfalls, pools, flowers, and vistas. For instance there are some stupendous ficus trees that were used in the movie Jurassic Park. My favorite portion of the garden is the wave form water feature. This water sculpture is a long line of a structure that has an inner and outer shape of double undulations. The water flows through these wave shapes via a barely perceptible slope from a circular pool on one end to a circular catchment pool on the other end. Because of the beaded shape, the water pulses through, rather than rushing straight down. The set of double undulations that contain the water, manage its flow. When water comes to the end of the 127-foot long stream, the pulsations of the water pour into a basin in discrete amounts, creating audible beats. This slow, regular pulse is about 52 beats per minute. To be near it is mesmerizing, relaxing, wonderful. It entrances. It quiets the mind, soothes the spirit, and strengthens the inner senses. It is a water massage of the body, mind and spirit. There at the garden, I wondered how I could get one of these in my backyard. 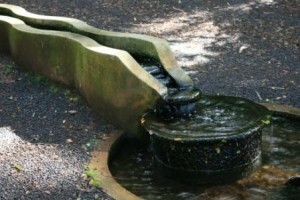 To see a photo of this feature, go to Google images and enter “Allerton Garden Mermaid Fountain”. In such blendings of art and nature, of science and spirit, of flow and directionality that we can access what it means to be more fully in tune with the power, presence and potential of our reality. Being near the waveform sculpture reminds of Qigong and Taiji movements with their slow, wavelike rhythms of movements and breathing. These movements are the structure that entrain and train your physiology and psychology. They balance the flows of nerve pathways, lymph pathways, blood circulation. The fluid flows become strongly entwined, whole, regular, pulsating. This brings about a delightful inner peace, satisfaction, quiet joy. In your own backyard, so to speak (your body), you have such water features. You have organic metronomes that can bring you home. The focused focused, slow movement expands the production and interconnectedness of your cells, systems, waters, electricity, magnetism. You can connect to the resonance and microcosm of nature’s power. Through the constructed and evolved arts of Qigong or Taiji you can open to the great river flows of possibility that already flow through you, informing and impassioning you. I think that the 52 beats a minute rhythm connects to some ideal, at-ease, heart beat within a person. This brings a calmness and connection to many parts of the body at different speeds. It just starts with that one slow heart speed. It is one doorway to the great collections of rhythms that make up your being. Opening that one door, other rooms become affected. 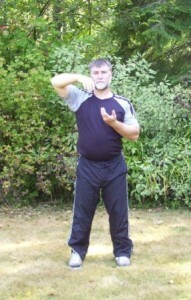 Qigong can be thought of as the Art of Waves. You move in slow frequencies that tune you into the natures rhythms. Repeated waves of movement wash away the stones, smooth out the rough spots, move and endlessly continue to move all in its repeated path. Thus the rough and jagged becomes smooth and soft. Thus life flows better. The following five skills are the principles by which to train your Qigong. They are a five-sided diamond that shine light on your practice. 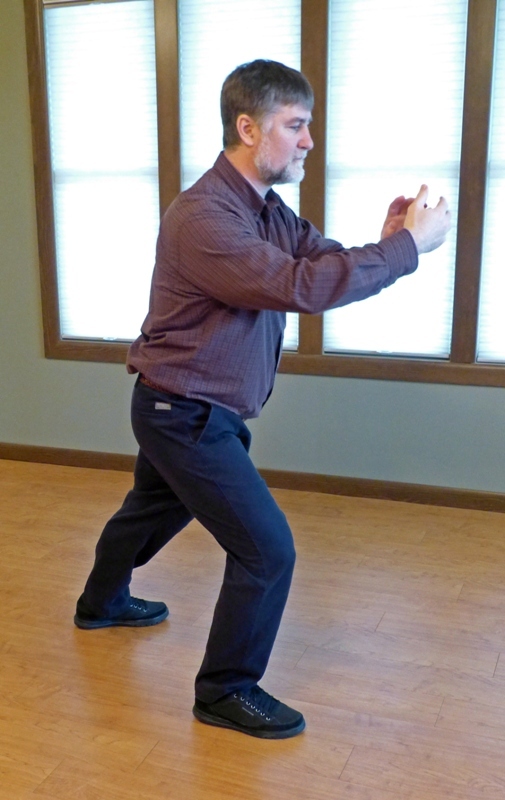 These five facets are approaches, principles, lessons and lenses that make the Qigong work. You learn from them, receive from them, then transfer them into the rest of your life. They are why you learn and practice Qigong instead of many other activities you could do. Building skill in each of these areas is what makes Qigong a powerful and effective way to improve your health, presence of mind, strength of being, and fun quotient. And you can take them into your other fun activities. Good structure is the perfected, relaxed, alignment of your body. It is how you hold your bones, muscles, connective tissues, joints, etc. These are basic life skills that are almost always a surprise to Qigong students. We just aren’t taught most of these functionally strengthening methods in our culture. Examples: Heavy elbows, relaxed shoulders, vertical body, open armpits, open hip joints. When you take your structure in motion, a number of movement principles come into play. These include the quality and quantities of your motion, the rate and rhythm, and the keeping of your key alignments. Strength in relaxation is the result. Stability in flow is another result. Examples: Knees on a track, no bobbing up and down, pelvic tilt, push from the back. Learning to direct your mind is key to health and strength of purpose. In Qigong training you gain experience in grounding, rooting, and centering. You get out of your brain and into your body—an important part of staying sane and living an inspired life. You balance your focus and expand your horizons from a grounded stance. Examples: Center in your lower abdomen, sink your mind, feel your bones, quiet mind. In Qigong you learn about your energy centers, points, vortexes, flows, reservoirs, and rivers. Getting these down—like all of the five facets—make your body significantly stronger, more resilient, more grounded, and present—almost instantly. Examples: The Gate of Life, the Dantian, the Microcosmic Orbit, the Bubbling Springs, the Taiji Pole. Breathing is probably the single most powerful healing magic you can discover and develop. It is free medicine you can imbibe every minute you awake. You will learn how to breathe more easily, deeply, smoothly, fully, deeply, rhythmically. Breathing better helps every single aspect of your body, mind, emotions, and spirit. Examples: Belly breathing, 3/3 rhythm, spherical breathing, Kidney breathing, full vase breathing, breathe with the movement. Know what you are attempting when you engage in movement practices. Just moving is useful, but if you know why you are doing something you get far more out of it. You can focus your training to build a depth of expertise. You will know how to shift something if it isn’t quite working. It is a fulfilling, ever-growing, ever-glowing way to practice. I am excited to announce the completion of my new Qigong DVD. You can pay through Paypal, or with a credit card. I will send the DVD right out to you. This would make a great Christmas gift, a way to encourage yourself or loved ones to get a Qigong practice going in their life for the new year. It is just $19.95 plus $3.99 shipping and handling. • Consists of 12 exercises. • Teaches many Qigong principles you can apply to your life. • Fosters internal relaxation and coordination of body, mind, breath, and energy. • Is easy to learn. It is not confusingly philosophical, or super-serious. • Helps all parts of your body become equal with the full flow of energy, information and awareness: left and right, palms and feet, arms and legs, head and feet, torso and legs, front and back, inside and out. Each of the 12 exercises is found in the flowing body of a gentle exercise form called Primordial Qigong. The word primordial here, refers to your original vitality. 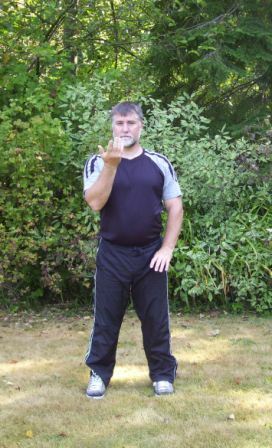 The Primordial Qigong form is a flowing, connected sequence of the movements, much like Taiji (Tai Chi) is a slow stream Qigong sequence. 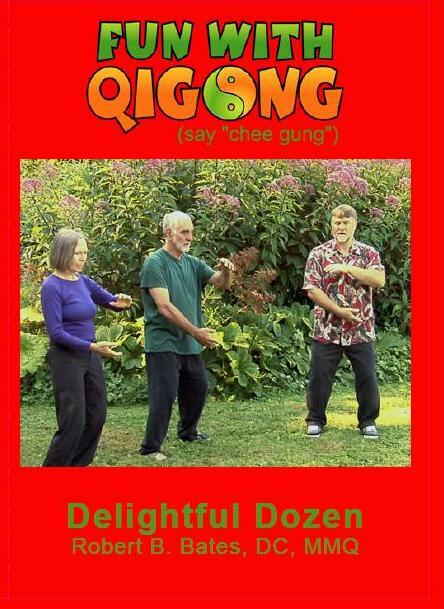 I first developed the Delightful Dozen Set as a way to teach the moves of Primordial Qigong. Eventually I realized it was a marvelous practice in itself, and an ideal teaching tool for the principles of Qigong. It is a beautiful Qigong on its own. After you master the Delightful Dozen, you may want to go on to learn Primordial Qigong, which I also teach. If you have learned the Five Flows Qigong, which is the first video in this series, The Delightful Dozen will expand and deepen your skill. If you haven’t learned the Five Flows, you might want to go back and learn it first. • For this new video I again take out mysteriousness and make Qigong as accessible as it truly can be. With principles taught on the DVD, you can gain great benefits from a regular Qigong practice. • The Delightful Dozen is slightly more advanced than the Five Flows, but you can learn it as a first set if you choose. It is also an introductory set for Qigong. • In terms of the flows of Qi as defined on my Fun With Qigong: Five Flows DVD, the Delightful 12 is mostly balancing, with some charging and some centering. • I hope you gain rich rewards from your learning, practice and eventual mastery of the Delightful Dozen. 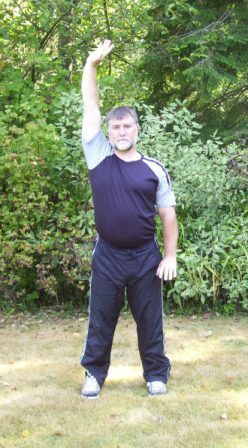 • An introductory section covers the basics of Qigong training. • In section two I present and explain the moves of each exercise,. • Section three is where you deepen your experience and magnify beneficial results by focusing on specific principles in turn. In order and over time learn and practice the Structure Principle; then, get the Movement Principle, Qi Principle, and Consciousness Principle. • Once you have learned each of the exercises, you can go ahead in the DVD to follow along with the Full Set Practice in Section four. • Once you are completely familiar with the set, you can practice it on your own. It’s fun, easy to begin and helps you feel great. The Delightful Dozen can boost your immune system and could protect against illnesses…from colds and flu to far more serious diseases. The Delightful Dozen trains you to be natural, at ease and empowered in your own body. By incrementally improving how you move, stand, breathe, and think, you improve your state of body, mind and emotions. This Qigong is simple to begin to learn and most people begin noticing results right away. Yet, the Delightful Dozen, like most Qigong, has layers and aspects more that add depth, breadth, sophistication that, as you learn them, increase the effectiveness of the practices and magnify results. 1. Basic Idea. First get just the basic idea down—a rough sense of what you are doing with your arms, legs and waist. 2. Structure and Movement. As you get better with a new exercise you begin paying more attention to structural details and movement precision. You also get more able to align the movements with your breathing rhythm. 3. Energy and Consciousness. After a span weeks practicing a move, the exercise becomes more familiar. Now you can begin adding focus on what the Qi flow is doing, how your energy is, and where your mind is. By this time you are attaining a complete exercise, one that is replete with benefits. 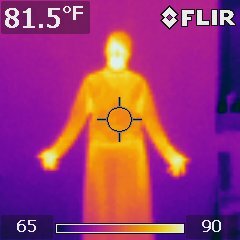 On December 03 of 2010 I invited a friend with a thermal imaging camera to come to my Qigong class to take heat photos of our bodies and hands. 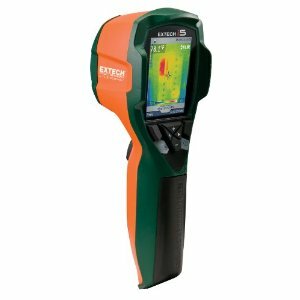 This camera is a hand held device used primarily to look for heat leaks in buildings. 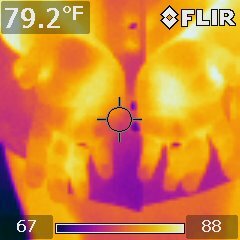 We previously photographed hands in a class earlier in the year. 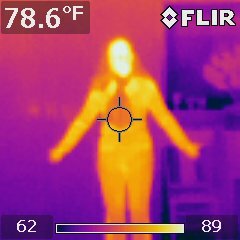 The thermal imaging camera works great as tool for exploring certain aspects of Qigong. The swashes of bright colors give an overview of how someone’s Qi and blood flow are. The balance of colors show how balanced the body is. 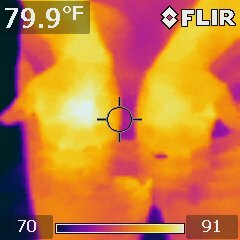 The type of color shows the level of warmth in each area. Extech i5 is the camera’s designation. We took photographs both before and after class. Our class exercises consisted mostly of slow, whole body charging exercises with particuar focus on the hands, Kidneys, legs, Dantian and Lungs. Following are some of the things we learned. Even though cold at the begining of class, this persons’s hands were much more balanced to start with than earlier this year. And the hands are way hotter after this class than before it. Notice also how the heat of her head becomes more balanced by the end of the class compared to the photo before class. 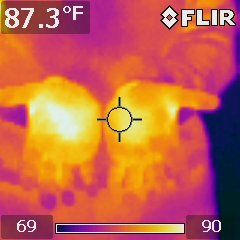 She has distributed some of the head heat down into her arms, hands, torso, and legs. She is learning how to use Qigong to shift the state of her body in an intentional way. 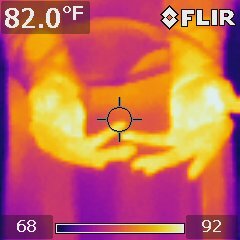 This person’s hands and fingers heated up a lot from the Qigong. Though the hands warmed up signifcantly, an imbalance shows between the right and left hands. There is a bright circle of warmth in the right palm that does not express in the left hand. This might have to do with blocked lymph flow in the left arm and axilla (armpit). I suggested to keep practicing with awareness of allowing the left flow to be open and equal to the right. The way to do this is to pay attention to the various sensations in both hands, gently seeking for more similarities left and right. 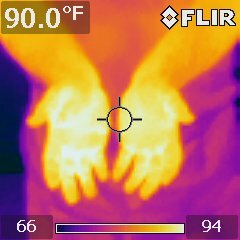 These photos show that the hands heated up very well from the Qigong, and that there is more energy in the head than is probably healthy. Too much energy in the head is a precursor to many kinds of problems. 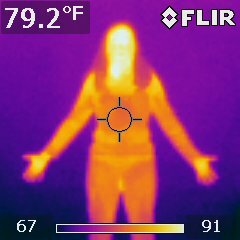 After viewing the photos, I suggested she focus on her feet more to bring more energetic, thermal and neurologic balance to her entire body. And focus on the Dantian when practicing Qigong. 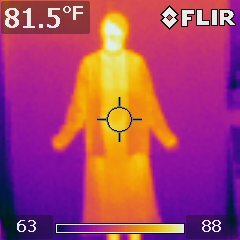 In the photos below you can see that clothes keep the heat in. But both the head and the hands were visible and comparing them was useful. A hot head and cold hands are, in general, the reverse of what you want. Seek a cool head and warm or hot hands. 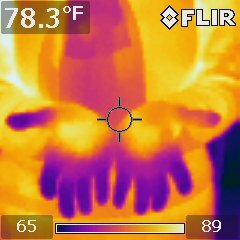 These photos show lots of energy in the head and moderate energy in the hands. I suggested working on learning how to send that head energy to the palms and fingers.This is actually the essence of a Qigong headache remedy: Send the excess heat in the head down the arms to warm up the hands. The pain in the head will often reduce or go away through this simple prescription. 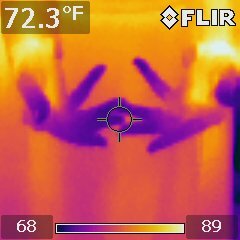 This person heated her hands up significantly. 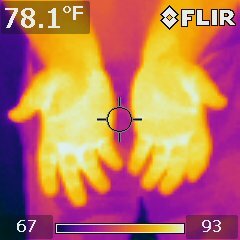 My hands are usually warm to hot. 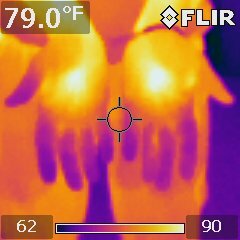 They tend to heat up and turn on when I do hands-on healing work with people. 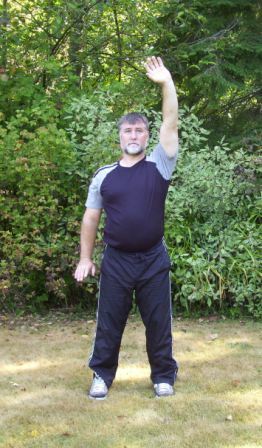 People who have practiced Qigong regularly for a few years usually have hands that are warm, alive, and balanced in Qi. This is a generally true even at the beginning of a practice. Warm hands become a way of life. Warm hands, balanced left and right, are usually indicative of health. Here is another example of the power of Qigong to energize. This student’s palm areas (Lao Gongs in Qigong lingo) are warm to begin with, but his fingers and left thumb are cold. With Qigong practice this person’s Qi and blood began to suffuse his fingers. This student has been practicing Qigong for less than two years, and is learning well how to reorder his blood and Qi flow. This student’s hands show a cold and imbalanced profile to start. Notice the marked purpleness on the right hand. The left hand is more lavender. Both are cold. Wow! Warm and very close to being balanced. This person has been studying Qigong for more than two years. He is making great progress in learning how to shift his energies. Cold fingers with some brightness of heat in the central palms to start. Notice how much improvement there is here. A little imbalance shows in the fingerpads, but overall, the photos show a marked improvement in less than an hour of Qigong practice. This student has been practicing Qigong for a little more than a year. According to an article on Vietnam net on Dec 12, 2010, a man died after two months of fasting, reportedly for a Qigong regimen. This 34-year old martial artist in Ho Chi Minh City was on a water fast in order to clear his blood and organs of toxins so he could build up his Qi . Instead he killed himself from starvation. This fellow was practicing a method to the extreme. Extremes do not heal, strengthen, or make healthy. Extremes push boundaries, but healing happens with balance and relaxation. The great, crazed Nietzsche famously wrote that “What does not destroy me, makes me stronger.” In the context of a personal health approach, this is nuts. Anything that almost kills you makes you need to rehab and re-strengthen afterward. Gentle Qigong practice helps us recover from the stresses, messes, strains, and pains of life. Don’t reinjure yourself when you are trying to heal. Don’t break yourself trying to remake yourself into something greater. I once experimented with fasting after reading various enthusiastic books about it and it’s magic. These books weren’t written from a Qigong perspective; more from the American Naturopathic tradition. After I graduated from Chiropractic college when I was 25, I checked myself into a fasting institute in order to capture some of this magic energy and health that the fasting books promised. I wanted a jump start for my upcoming professional career. My water fast was only 11 days, not two months like the guy in the news story. The fasting institute was pleasant. 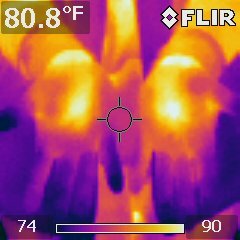 It was in a former residence in the suburban hills north of San Francisco. A lovely setting amidst the rolling hills, fields, and oaks of Northern California. 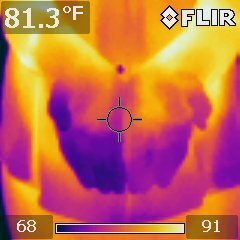 The doctor and staff there were personable, knowledgeable and committed to their work. There were 8 or 10 of us there for the fasting. My experience was not as promised from my studies and inquiries. Friends had told me that after 3 days I would be full of energy. Not having to eat food I would be on a kind of a high. Instead, I got more and more tired. I got around the place in slow, heavy ambles. Once a day I would take a slow, labored walk up the hill on the paved road, feeling a thousand years old in my steps. Maybe I was just so full of toxins that I never did get them cleared all out. I was also told that I wouldn’t feel hungry after 3 or 4 days. Yet hunger never left me. I will tell you, just from this little civilized test, starvation is no fun. I hope I never have to face it for real. I got hungrier and hungrier. I never stopped craving food; never stopped thinking about it, longing for it, daydreaming of it. On day 9 of the fast I was the sickest, clearing toxins through my amber urine. By day 11 I was no longer sick, but was so hungry, so physically and mentally frail. I was too tired to read much even. To have the time and leisure and books, but no energy for reading is a kind of a hell for a bibliophile like me. On day 12 I came off the fast, starting my caloric intake with a glass of watermelon juice each at breakfast, lunch and dinner. Yummy. I savored that fruity succor. Another day or two of juices and then on to giant, dry salads that took an hour to eat, chewing at maximum speed. After the last day—number 17—I left the institute and drove home. Still weak and hungry, I craved fat and bought packs of macadamia nuts at a gas station/store. How delicious those were. I felt fragile and feeble in my body for several weeks after the water fast. I lost weight, but I also lost energy and oomph. It set me back, rather than vaulting me forward. It may be that I fasted wrong, or not long enough, or it just wasn’t right for my constitution. For me anyway, fasting wasn’t the answer. It would be 5 more years before I discovered the non-weakening power of Qigong. Fasting should be taken in small amounts, a day or 3 for most people is plenty. Short, periodic fasts are a time-tested way to more health. Longer fasts may be appropriate for some people, occasionally, but I wouldn’t put much trust in going too long. Be careful of extremes of anything. Any extreme is an imbalanced state that doesn’t take into account the other extreme. It is a one-sided, lopsided, untenable position, for the other side must come along to balance out the lever. Here’s a positive and proactive way to look at breast health. There are so many healthful, non-traumatic ways to work with breast health. Below are exercises, videos, a book, some links and some simple philosophy. 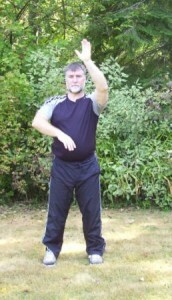 The first information I share is from the Qigong tradition. One of the main points is to keep the tissues, fluids, and energies flowing. Stagnation is the breeding ground of disease. Movement is the keeper of health and progenitor of healing. Here are three Qigong exercises that help with breast health. Note: The Five Flows DVD includes Exercises # 1 and # 2 listed below as well as additional immune-boosting, easy-to-learn, Qigong exercises. Shaking the Body is basically just gently shaking up and own. Shaking will stimulate circulation, increase lymph flow, and release stagnation at the cellular and tissue levels. Shaking with intent offers many benefits. One of them can be to release a stuck, stagnant or hot Liver. In Chinese Medicine thought, such Liver conditions are usually a part of the toxic stagnancies like cancers. One of the great benefit of Streaming the Fountains is that the arms are repetitively, rhythmically, slowly raised above the head and then lowered. 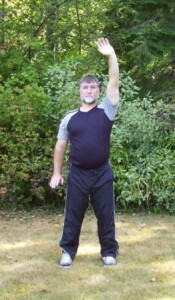 Raising the arms in this way opens the lymphatic pathways through the armpit. 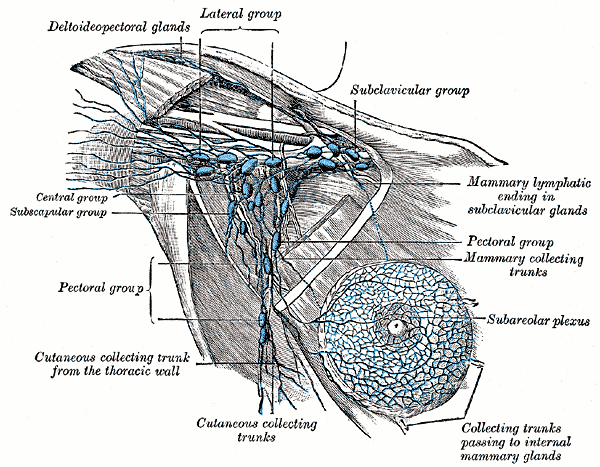 The greatest part of breast lymph is drained through the lymph nodes in the armpit (the axillary nodes.) By slowly and smoothly practicing Streaming the Fountains, the axillary lymph nodes are gently stretched and opened; then lightly compressed. A lymph pulsation then ensues, releasing tenderness, decreasing tension, and increasing flow through your breasts. Press Heaven and Earth is a similar exercise to Streaming the Fountains in that you are raising the arms and drawing energy up and down the body vertically. It comes from the ancient 8 Silken Brocades Set. Once learned well, it is even more effective in moving stuck Qi in the chest and opening the armpit nodes than Streaming the Fountains. Slowly, over 3 to 5 seconds, press and stretch one hand high and one low. The high hand is over the head and the lower hand at the outer thigh. The upper palm is bent on the stretches, with fingers facing inward. The lower palm stretches down at the side of the thigh. Exhale as hands go away from each other. Inhale as they come toward each other, crossing at the chest. This also is done slowly over 3 to 5 seconds. The slowness allows a smoothness of movement and empowered lymph flow to take place. The hands also twist as they rise or sink, especially the rising hand. The International Institute of Medical Qigong has a DVD on using Qigong exercises for breast health and breast cancer prescriptions. These exercises use circular movements of the hands to increase breast Qi flow and special healing sounds. The teacher on the video is Jerry Alan Johnson, my own Medical Qigong instructor. Here is a short video of a lymphatic pumping breast massage, basic but powerful and important. Some 70 percent of the lymph of the breasts flows to and through the axillary nodes. It is very, very important to keep these pathways open and always flowing. Flowing lymph clears stagnations that might otherwise lead to disease. 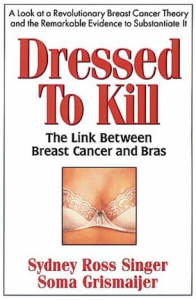 The book Dressed to Kill makes the argument that tight bras lead to an increase in breast cancer. Some authorities pooh pah this assertion. It makes clear sense to me, however. A tight bra will compress the skin and lymph flow of the breast, especially in the most important channel along the upper, outside ribs toward the armpit. Many women, after learning about this, rethink their bra choices and bra-wearing patterns. Basically, wearing bras less often; wearing bras more loosely; and keeping the flows a going. Those that might dismiss this book as pseudoscience are missing the point: That marketing undergarments is a science, one based on profit, not truth. And from my extensive studies in Qigong, Lymph Drainage Therapy, Visceral Manipulation, and Cranio-Sacral Therapy—I think the authors of the book have a strong message that needs to be listened to and explored further. Here is a site devoted to the natural, Chinese Medicine thinking about breast health and approaching breast cancer through Qigong, acupressure and other proven natural methods. The superb system of Lymph Drainage Therapy has even more sophisticated approaches to working on the breasts. Anyone who has taken the second course in LDT from the Chikly Health Institute (formerly with the Upledger Institute) has learned the Breast Drainage approach. You might want to find a qualified therapist to help with this. Note: Different states, regions or countries have different laws for which licensed therapists can work on breasts. Here is a video that is more of a teaser; it doesn’t show the breast massage techniques, just some women talking about the process. The video looks like it might be worth exploring, worth getting the DVD if it speaks to you.